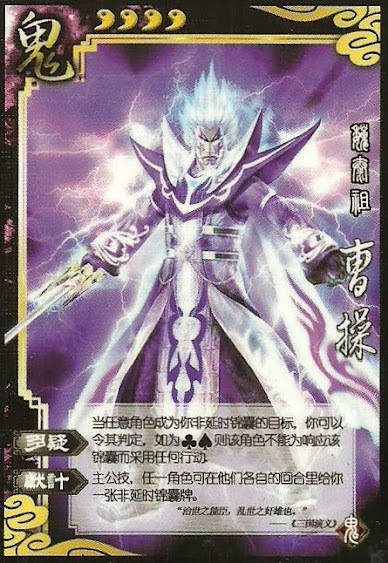 When anyone is the target of Cao Cao's tool cards, he can force them to do a judgment. If it is black, that person cannot play any card to respond to the tool card. King Ability: Any player can give Cao Cao a tool card during their turn. Both "Suspicion" and "Offer" do not work with delay tool cards. If the judgment for "Suspicion" is black, the targets cannot play any cards to respond to that tool card. This includes Negates, Attacks, and Escapes. Blazes will still work since the target must only show a card. "Offer" works the same way as Zhang Jiao's "Amber Sky".